My kitchen has undergone a major makeover and while it isn’t quite done yet, I already feel as though I have a brand new space. It is light, airy, and fresh. If you haven’t done much with your kitchen, consider a few quick touches to update and personalize your space. Apartment kitchens are often small, dated, or plain. If you feel trapped in a bland, empty box, a few quick fixes will make all the difference. Even if you don’t spend much time in your kitchen, making it a space you enjoy may make cooking at home a little more appealing. Choosing a color scheme is easier than you might think. Peruse magazines, browse through pictures, or select a favorite painting you may already have. Choose the colors from that image and work with those. For example, a picture from your recent beach vacation could inspire you to use blues, off-whites, and hints of green. My kitchen inspiration came from a magazine photo of a country French kitchen done in shades of yellow and blue. You may not want to paint your kitchen, even if painting is allowed in your apartment community. 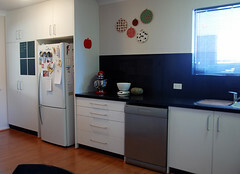 It is a challenging space to paint with cabinetry and appliances to work around. And if you have to paint it back before moving, that will mean painting a difficult space twice. Instead, add your chosen colors through kitchen rugs, barstool covers, lighting fixtures, wall art or decorative plates, curtains, small appliances, and kitchen décor. Plain, boring tile can be transformed with clever tile tattoos – they peel off easily and cleanly. If you hate your vinyl flooring, cover it! It can be something simple, such as foam puzzle mats (yes, the ones used on kids’ playroom floors … if you don’t like the color, paint them – then use a stencil to create an appealing pattern) or something a little more sophisticated, such as floating cork floor tiles. Just be sure that what you put down can be easily removed without damage to the vinyl underneath. A quick, easy kitchen transformation can be made simply by switching out the knobs on your cabinets. From fun and funky to sleek and sophisticated, find something that suits you. Your cabinets will be instantly transformed. Add some decorative decals to your cabinets to add even more visual interest. Paint a pegboard a bright, bold color and hang it on the wall. Add hooks to the pegboard and use this as a storage area for pans and utensils, freeing up precious cabinet space and adding functional wall art. Find a great old framed mirror at a flea market or thrift store and turn it into a chalkboard message center to hang in the kitchen. To create storage space, add shelves. Floating shelves are ideal in a kitchen because they’ll fit in smaller spaces. Baskets, a small kitchen island on wheels, and plate shelves all add charm to your kitchen while freeing up countertop and cabinet space. If your kitchen is especially small, consider removing a cabinet door or two to create the look of open shelves – just be sure to keep this area neat and organized. With a few pops of color and some creative fixes, your kitchen will quickly become your favorite room in the house.